BREAKING NEWS! St Nicholas has been nicked! Home/Blog/BREAKING NEWS! St Nicholas has been nicked! 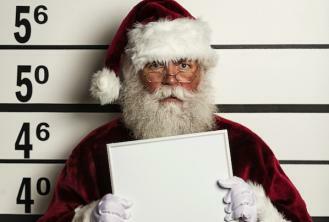 Father Christmas was arrested last night for a string of criminal offences including breaching the Data Protection Act as well as alleged Stalking and Harassment. Father Christmas has made a statement in which he claims he thought he was doing the right thing and was keeping all wish lists and naughty and nice lists ‘just in case they were required in the future!’ We’re unaware of actions that might be taken but we could see Father Christmas given a custodial sentence or a hefty Information Commissioners Office fine! The only good news to come from this very sad story is that present production is on track and every good little boy and girl will have presents delivered on Christmas Eve!